There’s nothing worse than being caught in the middle of a breakup between two parties you like equally. No matter what, you’re always going to end up taking a side, even when you say that you won’t, and there’s always going to be one side that ends up looking the worst out of the two. The schism between Team Arrow Classic — Oliver, Diggle, and Felicity — and New Team Arrow — Rene, Dinah, and Curtis — plays out a lot like a bad breakup. Everyone’s avoiding one another, and in the rare occasions where they do meet up, it almost immediately devolves into arguing. In the case of someone being in the wrong here, it’s certainly Team Classic. As Curtis says at the end of the episode, Cayden James may have led to the team’s overall fracture, but the things Oliver, Felicity, and Diggle did to their younger members were what truly broke them all. Some of these acts were intentional, others weren’t, but those things still happened. To that end, the show could try a little harder to not make Team Classic act like they have the high ground here; as much as Oliver claims that there’s blame on “both sides,” it feels like we’re automatically supposed to be in support with the veterans rather than it being a real dilemma over who to pick. It also doesn’t help that in refusing to bring the ex-members into the fold about Cayden James’ posse, Oliver’s decision to work with a criminal — Jerry Bertinelli, cousin of his old ex/vigilante Huntress, Helena — comes across as a bit hypocritical. Bertinelli, having been threatened by James and Black Siren in the episode’s open, decides to bring Team Classic in on the loop because his daughter’s life is on the line and those three have a good track record when it comes to the Bertinelli family. Still, the point of including the Bertinellis is to show that when it comes to family or the ones we love, you’d do pretty much anything to protect them, helping Oliver see things from Rene’s perspective a bit more clearly. Incidentally, Rene continues to be one of the best additions to the show’s cast. Rick Gonzalez has managed to do a lot with the character to elevate him from what he initially was last season, and it’s he’s proven time after time that he can effortlessly switch between “badass Wild Dog” Rene and “caring father” Rene. I have to hand it to the show for letting Rene stay in the right while also having him admit that things could’ve gone much better than they did. Compared to how Oliver used to be considered right by default in the past, it’s a welcome step up. Arrow is fully aware that it’ll take more than a simple apology for Team New to merge back with Team Classic, while also knowing that eventually, the two will become one yet again. Normally, that would be frustrating, but the show has done a great job in developing these characters over the years that I’m willing to let this split go on for as long as they wish. 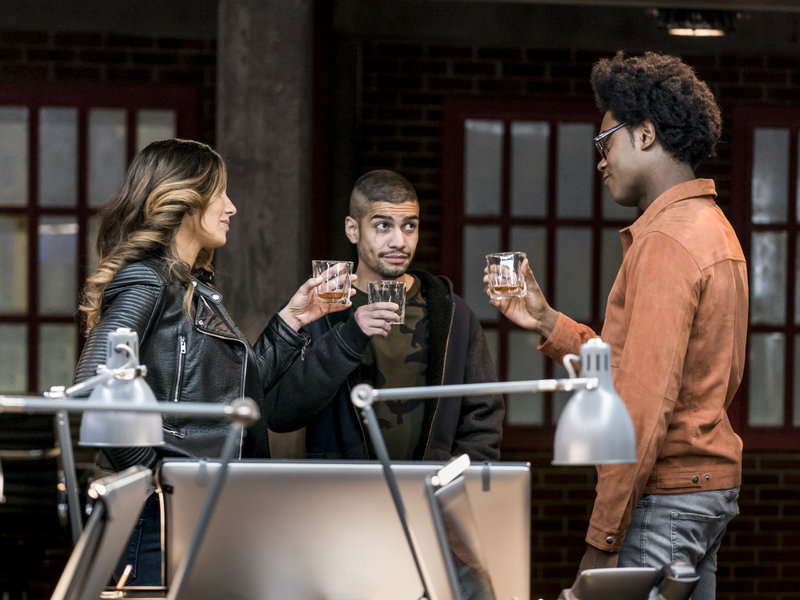 That both teams are able, at the very least, to extend help to the other side — Diggle gets a fix for his arm, and Team New learns that Vigilante is on Team Cayden — goes a ways toward building a bridge they’ll all be able to walk together. Some breakups are rough, but this one is clearly needed, and will most certainly lead to a better renewal. Team Classic finally realizes that they’ve been bugged for the past three months! Better late than never. It’s looking like both Vigilante and Black Siren will be defecting by season’s end. Lance is refusing to give up on his (technically?) daughter, while Vigilante is still very much still in love with Dinah, who’s none too pleased to hear he’s on Team Cayden. Either way, those two will definitely have a road to redemption in front of them. This week, we learn that Diggle plays Halo, and all I want to know is if he’s a fan of Grifball or no. “You don’t knock?” “You don’t lock your doors?” She’s got you there, Rene. I’m glad that Siren was willing to call out how no one ever actually manages to kill Oliver because the second they’ve got him at gunpoint, they decide to monologue.